How much Pep is there in Bayern? Munich - When Pep Guardiola took charge of FC Bayern München last year he inherited a side that had just won a treble unprecedented in German football: under Jupp Heynckes the Bavarians lifted the Bundesliga title, the DFB Cup and the UEFA Champions League. That, understandably enough, led to many observers asking what the Catalan coach could possibly do to improve the team. In the first part of bundesliga.com’s series on Guardiola, we explore the ripples he has made in the Bavarian capital thus far. Perhaps the most telling insight into the 43-year-old’s character came earlier this year on Whit Sunday, when he took part in a demonstration backing Catalonian independence in Berlin. Self-autonomy, doing things his own way: that is of utmost importance to Guardiola. He held his very first press conference as Bayern coach in German, a notoriously difficult language to learn, having studied it intensely during the six months leading up to his tenure. So Guardiola is a well-liked, independent-thinking, family man, but what impact has he had so far? Any thoughts of him merely taking over at the helm while allowing the Bayern ship to steer the same course were quickly dispelled after his arrival. The 43-year-old unexpectedly announced during 2013/14 pre-season that the team “needed Thiago’s qualities in midfield,” and that the club were actively pursuing the young Spaniard. Guardiola also converted his captain Philipp Lahm - a lifelong full-back - into a world-class defensive midfielder, a position he would also play under Germany coach Joachim Löw at the World Cup in Brazil. That opened up a space at right-back for Rafinha, who had previously been on the fringes under Heynckes, to become a first-team regular. 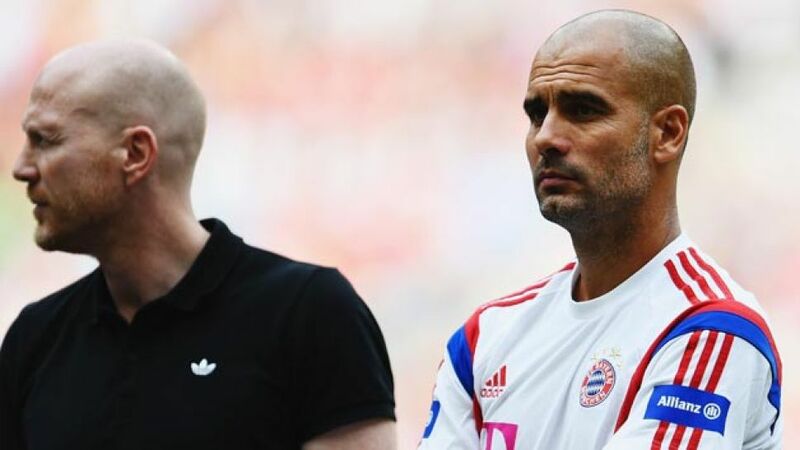 Furthermore, Guardiola has been unafraid to experiment with personnel and formations, handing first-team debuts to youngsters Julian Green and Gianluca Gaudino in the UEFA Champions League and Bundesliga respectively, as well as fielding a three-man backline this season. “What makes him such a good coach is that he knows how to optimise something that’s already good,” Guardiola’s former manager Johan Cruyff said of him. Yet while it is true that Bayern have increased their possession during games under Guardiola, they have also become more flexible and less predictable. For example, against Dortmund last season they played a long-ball game to counteract BVB’s intense high-pressing tactics, while his side also make greater use of the aerial ability of their attacking players. It is clear, then, that Guardiola is making his mark at the club and given that five fellow Spaniards are now on the playing staff, four of whom - Javi Martinez excluded - were signed by him, his Iberian influence is sure to continue growing for some time yet.